S. Paul note: I agree in large part to this opinion but we should not forget that the Democrats seem to have left We the People to fend for ourselves in the shadow of the reconstructionist, Christian Coalition controlled, Republican style of corporatism. It seems both parties are only baiting each other to fail in the name of political control while America suffers for their lack of leadership and the loss of any representation or hope we may have had. The current dysfunctional, corrupted Congress, with the Republicans acting as obstructionists, is causing great damage to America. But as bad as this situation is, it can get much worse. 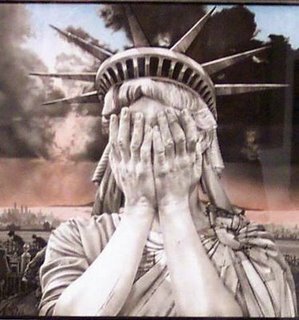 If the American people, in the elections of 2012, make the monumental mistake of allowing the demented Republican ideologues to take control of Congress and the White House, life in this American society will become a nightmare without end. The GOP and this American society are entirely incompatible. Society can be defined as " a community, nation, or broad grouping of people having common traditions, institutions, and collective activities and interests; a voluntary association of individuals for common ends. To say that the Republican Party and this society are a part of an association for common ends is ludicrous. There is a complete disconnect between them, with each having an entirely different view of how this nation should function. The Republican Party of today has become the sworn enemy of this society and its people. It intends to dismantle the most important entitlements that make up the social safety net for Americans. It has a deep seated hatred for anything that benefits the mass of the American people and a deep love for protecting the interests of its corporate masters. The GOP calls Social Security, a program funded by we the people, a social benefit; that's a misstatement of the facts, a blatant lie. The Republican misfits in Congress are blessed with excellent health care and pension plans but they do not want millions of uninsured Americans to share in similar benefits. That selfish attitude brings to mind a comment that Keith Olbermann made in 2009 during the contentious health care debates. He referred to some old saying, "I'm already in the rowboat, you can swim." Translated: "I've got mine. And if you're one of the tens of millions of Americans who've lost your coverage or can't afford a policy, well, that's not my problem, is it?" What a perfect illustration of the attitude of these sociopathic Republican politicians. This special breed of Americans appears to have lost its moral compass; people of this ilk are incapable of understanding the problems of people who are different from themselves, people who are beneath their levels of income and personal wealth. They view these "other" Americans with disdain and complete detachment. They consider them to be a sore on the body of America. Many, many of these Republicans profess to be devoutly religious and portray themselves as faithful Christians. Suppose that they were confronted them with this verse from the Bible which reflects a very basic Christian principle: "Whatever you did for one of the least of these brothers of mine, you did for me." What might these deeply religious people say? Well, it might be something like this: "Well, that's what the verse seems to say but that's not really what it means." These are the kind of people who tailor their religion to fit their own beliefs. What is happening to America is quite alarming. While the wealth of those at the top continues to rapidly increase, many millions of people are living in desperation. Food pantries across the nation can't keep up with people's needs, the ranks of the homeless continue to rise, people in California are living in tents, students with massive loans can't find jobs, and those who have jobs are becoming paranoid about losing them. This society and its people are reeling from this economic crisis, and they feel they have nowhere to turn. And under these abysmal conditions the leadership of the GOP continues to promote its antisocial agenda which is designed to strip away all government sponsored programs to help people in need. Yes, this party and its leadership are heartless and soulless with no regard whatsoever for the plight of their fellow Americans. It has no intention of embracing any type of job creation program. Jobs are not a part of its agenda, jobs are of no importance to them; one of their darkest objectives in the future is to have the majority of Americans work for the minimum wage in order to maximize the profits of Corporate America. The Tea Party members resemble a gang of thugs looking for a fight with anyone who stands in their way. They appear to be against anything and everything, from big government to entitlements, to paying taxes. Their only problem is that they have no solutions of any kind for these problems so their only recourse is to throw roadblocks in the way of any positive initiatives in the U.S. Congress, just as they successfully did in the deficit debates. Millions of Americans are thoroughly disgusted and sickened by politics in Washington and are paying no attention to these upcoming elections; but they better wake up soon and arm themselves with the facts because, if they don't, and they allow the Republicans to prevail and control the functions of government, they and America will thereafter witness a brutal attack on this nation's societal foundations. The positions that the current GOP presidential candidates are taking on issues that are critical to the future of this nation could not be more twisted and grotesque. So, if they somehow manage to seize control, here are the Americans who will suffer as a result: those who have or will qualify for Social Security, Medicare and Medicaid; the poor, the needy, the homeless, those on food stamps, students, teachers, police, firefighters and unions. These haughty, arrogant Republicans are flaunting their status as dismantlers of social programs and are almost daring the people of America to try to do something to stop them. They are fully aware of the massive voting power that the American people have at the polls but that power doesn't seem to frighten them in the least because they have plenty of dirty tricks up their sleeves. They are very aware that a very large number of the American electorate can be termed as "low information" voters; that many millions of Americans simply do not spend time in learning the facts about this nation's most critical problems. The GOP also knows that these same Americans can easily be fed misinformation through the corporate-controlled mass media without challenging it. It is very confident that many Americans who know the facts are so disillusioned with politics that they will not even bother to vote, thus giving an advantage to Republican candidates. The Republicans and Corporate America are preparing to generate a blitzkrieg of ads on television, radio and in newspapers to recruit those millions of Americans who are easy targets for misinformation. In these ads there will be no mention of any threats to entitlements or the elimination of government rules and regulations but, rather, they will feature all out attacks on the presidency of Barack Obama. The elections of 2012 are going to be critically important and very contentious. If the power of the people is organized and mobilized it can turn the tide against the GOP and send them packing. But the GOP and Corporate America will attempt to counter that power with their unlimited spending on campaigns across this nation. Only a massive turnout by the Democratic base can assure victory over this deadly alliance that intends to rule America with an iron fist. President Obama is gearing up for the 2012 elections and he's certainly going to need the support of the American people like never before. He's in for quite a battle because he has alienated much of his support base by failing to follow through on so many of his promises to bring change to America. As these disillusioned supporters approach the elections they will be faced with a real quandary in that they may not be thrilled with Mr. Obama but they know that if they stay home or dare to vote Republican, they will be creating a living hell for this society. The GOP has accurately been described as the Party of No. The natural state of these ultra conservatives is negative; they are regressive not progressive, obstructive not constructive, not builders but dismantlers, they deflate not motivate, they aren't creative, they have no vision for America. They are the antithesis of what America needs to confront and solve this nation's economic crisis. Corporate America and the GOP have formed the most deadly, sinister political alliance in the history of this nation. This alliance must be defeated and broken by the massive power of the people before it causes irreversible destruction to this nation.